TrafficBridge provides connections within and across organizations to assist network television advertising broadcast matches. 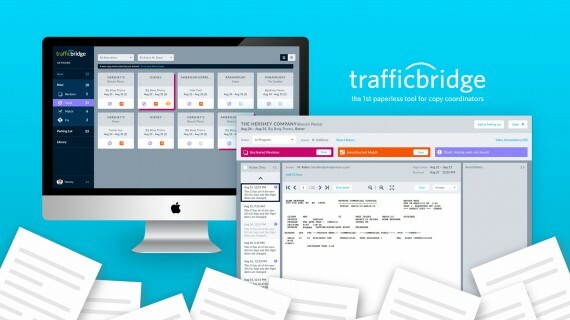 The current process relies predominantly on paper, fax and email instructions that do not provide clear ownership, resulting in time consuming, expensive errors.TrafficBridge delivers a solution that digitally coordinates communication between Advertisers and TV Networks and establishes clear ownership of instructions, empowering coordinators to work remotely, cover each other’s responsibilities and make fewer mistakes. Additionally, supervisors now have visibility into the process and can monitor the status of any copy instruction at any time. This oversight has the potential to restructure workflow within the multi-billion dollar industry.